Carl Johnstone (middle right) with his colleagues at Elders Esperance, WA and Syngenta Sales Representative, Brian Staines (middle left). Last season, Elders Esperance, WA signed up one of their loyal clients to Syngenta’s cash-back program, AgriClime. AgriClime offers eligible cereal growers a 15% cash-back on their investment in Syngenta technology if rainfall does not meet a threshold level over an elected period during the season. Carl Johnstone, Farm Supplies Sales Representative at Elders Esperance was really pleased with their involvement in the program and their grower even more so, having received a cash-back last season. “It enabled us to provide a value add service to our loyal clients as well as offer money back to our growers,” Mr Johnstone said. Since launching country-wide in 2016, over 420 growers have registered for AgriClime, covering in excess of 400,000 hectares. AgriClime is designed to help shoulder the risk of low rainfall periods with cereal growers. 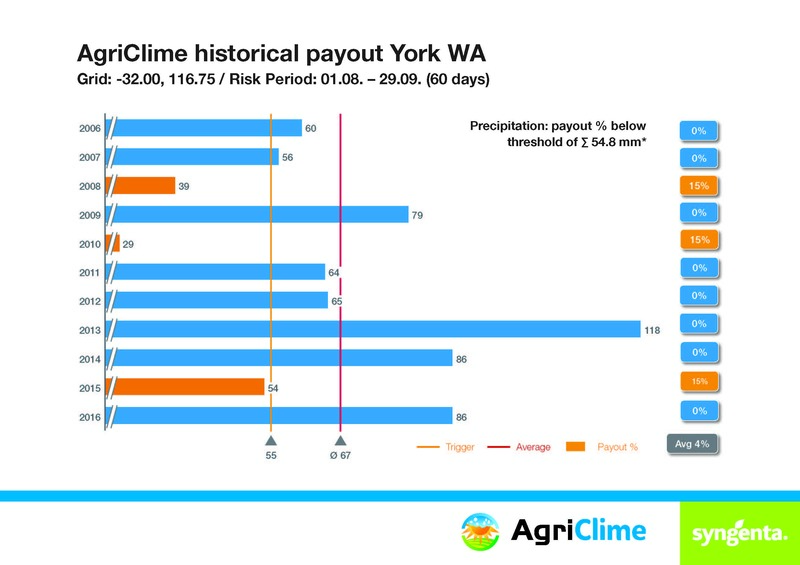 As an example, see Figure 1, which shows that York, WA growers registered for AgriClime during this period would have received a cash-back in 2008, 2010 and 2016. Registration for AgriClime is free of charge, however eligibility requirements apply. To be eligible, growers must spend at least $50 (inc gst) per hectare on select Syngenta products across a minimum of 300 hectares. Speak to your Rural Retailer and/or Agronomist for more information and to register your purchases this season for a cash-back.